by Truskey, George A.; Yuan, Fan; Katz, David F.
Presenting engineering fundamentals and biological applications in a unified way, this book provides learners with the skills necessary to develop and critically analyze models of biological transport and reaction processes.It covers topics in fluid mechanics, mass transport, and biochemical interactions, with engineering concepts motivated by specific biological problems.For researchers in biomedical engineering. The authors are faculty members in the Department of Biomedical Engineering at Duke University. 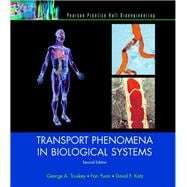 The authors are leaders in their respective fields of research and their research has involved various aspects of momentum and mass transport related to biological phenomena and technologies.